This was the fourth game in a six-game series between the Canada and United States national women's teams. So far, this season, Canada holds a 4-0-0-3 record against the US, Canada's and an all time record of 52-35-1. Bob Nicholson presents long-time women's star Hayley Wickenheiser with an award before the start of the game. She is the first female hockey player in Canadian history to hit a career 300 points. She scored it on September 1 against Finland. Team US opened the scoring with a power play goal at 11:51 of the first period: Meghan Duggan from Jinelle Zaugg-Siergiej and Kelli Stack. Caroline Ouellette tied it up at 17:42 from an assist by Jayna Hefford. Team US took a 2-1 lead in the second period with a power play goal by Jocelyne Lamoureux from Karen Thatcher at 4:44. Canada came right back at 10:44 to tie it up with a goal by Jayna Hefford from Caroline Ouellette and Meghan Agosta. The team then took the go-ahead goal at 16:39 -- Hefford's second goal of the game from Meghan Agosta. Marie-Philip Poulin cements at two-goal lead to end the period at 18:38 (power play) from Catherine Ward and Caroline Ouellette. Canada finished the game with a 6-2 win. Things got a bit rough at the 13-minute mark when a few roughing penalties were handed out in bunches. The next time these teams meet will be in St. Paul, Minnesota. *Canada won its 200th game against the US on October 5, 2009 (3-1). 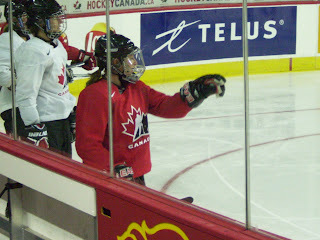 *September 3, 2009 was goalie Shannon Szabados' first loss (2-4 versus US). Up to that point, her record was 9-0. *Jayna Hefford is the second Canadian female to play her 200th game against the US. Only Hayley Wickenheiser has made the 200-game mark. * Jenny Potter is the only mother on Team US. Her daughter Madison is eight, and son Cullen is two. *Jocelyne and Monique Lamoureux are the first twins and first sisters on a US national team. *Jessie Vetter was named the Sportswoman of the Year by the Women's Sports Foundation -- the first ice hockey player to receive it. Learn more about Team Canada at www.hockeycanada.ca. Team US has a fan club at www.nscsports.org.